Graham Jaehnig/Daily Mining Gazette The Mariner North in Copper Harbor, where owner Peggy Kauppi has been welcoming guests for more than 40 years. 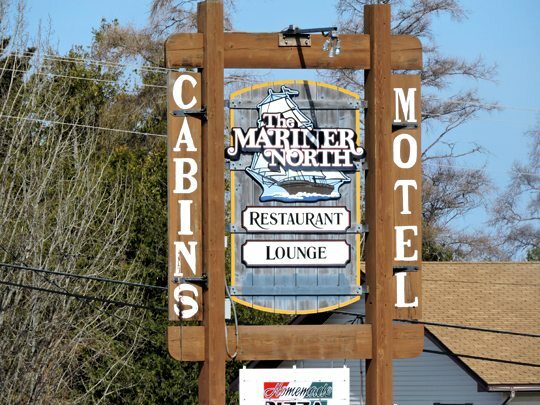 COPPER HARBOR — Peggy Kauppi has owned the Mariner North in Copper Harbor for nearly 41 years. While most people in business that long start to think about slowing down or retiring, Kauppi is working to expand business in her area. Kauppi bought the Mariner North as a result of her and her husband having spent time in cities, and discovering that was not for them. She said they left when they were in their 20s. He left the area after graduating, and lived in California for eight years, and she left to attend college at Michigan State University. One of the nice things about being a business owner in the Copper Country is that while Kauppi says she is fully aware of the existence of gender issues, she is largely free of them here. Kauppi cites as an example the number of men she encounters in her day-to-day running of the restaurant and lodgings. She referred to men who come to conduct furnace, electrical, refrigeration and other repairs. She does not have a memory of anyone treating her badly. As far as gender issues in Copper Harbor are concerned, much of them were largely based on cultural norms of past generations, largely when Copper Harbor marketed itself to the automotive tourists decades ago. The demographics have changed over the 40 years Kauppi has been in business. At one time, the majority of the visitors to Copper Harbor were automobile travelers, and the town was a destination. Cabins and lodgings were in high demand, but gradually the demand for cabins and weekly rentals declined, as RVs became more popular. Resorts such as the Breezy Point Lodge no longer exists, but yet, Copper Harbor kept abreast of the changes. Where once gem and mineral shops, souvenir shops, and the like were abundant, there are now kayak rental and sales stores, bicycle rental shops, and outfitters catering to the outdoor enthusiasts. “You would love it when there was a big layoff in Detroit back in the day,” said Kauppi, from a business standpoint, “because everyone wanted to take their vacations at the same time, and you could prepare accordingly. But it isn’t that way, and what’s great about that is we have evolved with the terrain, what we have here is that, it’s filling in the shoulder season.” The shoulder season in the Copper Country is season between seasons, she explained. “The primary season is June through October, then the marginal times, November-December, … and the spring, between the snowmobilers and the mountain bikers and paddlers,” she said. If seasons historically have affected business, that seems to becoming more of a gray area. Kauppi said she is amazed at how busy this shoulder season has been. Not that it has been busy in comparison to summer, she said, but Monday was a very steady day, business-wise.